I come across so many unique images when I’m searching for stock photos for this blog. It always makes me a little sad when I realize that nothing I’ve written so far fits them in any way. They’re the kind of pictures that demand an audience, so today I’m sharing ten of them with you in the hope that you’ll be inspired by them. If anyone uses one of these photos as a writing prompt, I’d love to know how you interpreted it! Send me a message about it on Twitter. I will include brief descriptions of the images in this post as well for readers who aren’t able to see the pictures I’ve found. This is a picture of a man who has tilted his head back and closed his eyes. 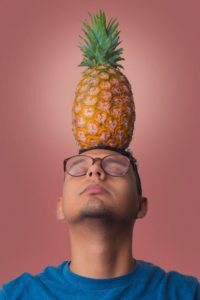 He has a neutral expression on his face, and he is balancing a pineapple on the top of his forehead. It makes me giggle every time I see it. I could see it being an eye-catching opener for a post about meditation, healthy eating, or alternative uses for pineapple for those of us who don’t like the taste of them. This is a picture of a man wearing the kind of thick, white makeup that clowns and other performers wear. 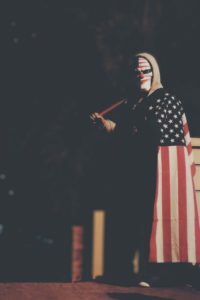 He has an American flag draped over his left shoulder and he’s slung a stick or weapon across his other shoulder. We cannot see the end of that item, only its handle. His face has a menacing expression on it. What a frightening image. It would make great fodder for any kind of horror tale, but I’d personally use it for something that revolved around not realizing a person or situation was dangerous until it was too late. Not every scary thing in life announces itself that way immediately. 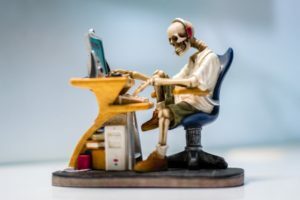 This is a picture of a skeleton wearing headphones, sitting at a desk, hunched over a computer, and typing on a keyboard. There was nothing alarming about this to me at all. The skeleton looks and acts just like a living person, so I’d imagine them in a completely innocuous setting whose conflict has nothing at all to do with the fact that skeletons shouldn’t actually be able to move around. For example, maybe everyone else sees a normal person when they look at this character. He or she is the only person who knows their true form, and they honestly find it kind of a boring topic. 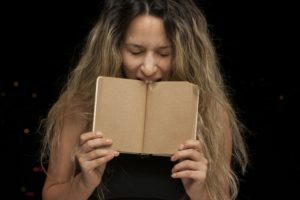 This is a picture of a woman grimacing and biting the pages of a blank, open book. Honestly, she looks hungry. Someone give her an apple before she starts devouring her tale from the inside out before its even had a chance to end. This is a picture of a viking who has a long, brown beard and moustache. There is a small mound of brightly-coloured confetti covering his facial hair. If this isn’t the perfect image to use for a story about an uncanny parade, I don’t know what is. 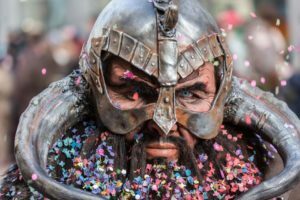 Perhaps Ivar was magically awoken from his eternal rest, and was terribly disappointed to learn that his new role in modern times was as nothing but the main attraction in parades, festivals, and other large community gatherings. He’d give anything for one serious conversation about who he was, where he came from, and how he died. A luddite lives here, and they have zero patience for cellphones of any sort. This could be horror as easily as it could be a romantic comedy. 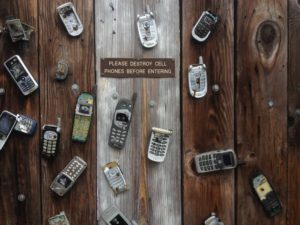 So much depends on how the luddite reacts when he or she meets someone who refuses to give up their phone. 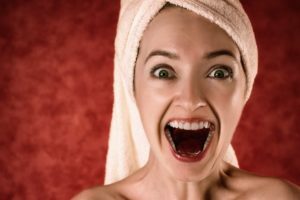 This is a picture of the face and shoulders of a woman who is wearing nothing but a towel on her head. The expression on her face could either be read as shock or surprise. I find this image unsettling. Is the woman thrilled or frightened? What could she have possibly seen that would make her feel both emotions simultaneously? 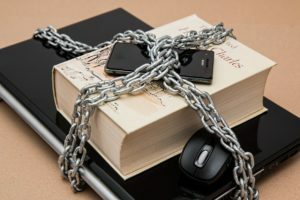 This is a picture of a laptop, book, computer mouse, and smart phone being wrapped up in chains. “Security” was one of the keywords labeling this image on the stock photo site I found it on. To me, though, it looks far more like it’s about limiting nearly every kind of information that’s available to the average person. How could someone learn about the world if they were denied the use of books and the Internet? 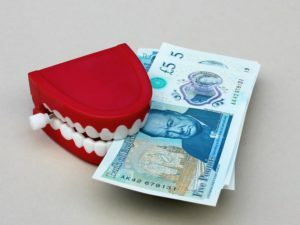 This is a picture of a pair of wind-up toy teeth biting down on a few 5 pound British bills. I giggle every time I look at this image. The first thing that popped into my mind was that dental bills can be very expensive. Maybe it’s a reminder to take good care of your teeth? This is a picture of a man sitting at a table. One of his arms is robotic, and he is holding his flesh-and-blood-hand in his robotic one. Is this futuristic or something happening now? From what I’ve read about replacement limbs, they have begun to be able to do all kinds of things they weren’t able to do before. I’ve heard of people being able to clench their fists, hold a glass of water, and do so much more with their artificial arms. If I were going to make this a scifi story, the entire right side of this guy’s body would be a machine. Maybe he was in an accident and lives just far enough into the future that machines can take over the work of some of his internal organs as well as his right arm and leg? For a contemporary setting, I’d go with something more ordinary like him forgetting to charge up his limb the night before and needing to sit quietly until it had enough juice in it to keep him going for the rest of the day.